Which type of Bitcoin Wallet to use when gambling online is one of the questions that is posed most when embarking on a cryptocurrency mission. There are desktop wallets, mobile wallets, hardware wallets, online wallets and even something called a brain wallet. What are they, you ask? Well this article will teach you about the different types of bitcoin wallets. You can even watch our informative videos on how to create and then fund your own bitcoin wallet. 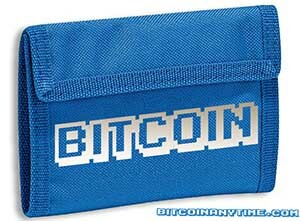 Your bitcoin wallet is basically like the virtual equivalent of the one you carry around in your pocket or handbag. They hold the private keys that you use to access a bitcoin address and make purchases, or transfer funds to a peer. You lose access to your wallet, just like in real life, you lose the funds that are stored in there. So it is crucial that you back up any passwords or addresses that are particularly valuable. A hardware wallet is a device that you can connect to your computer and keep your private keys externally to your computer, and more importantly not accessible from the internet. Current products which are in use are Trezor and Mycelium, which have both had strong reviews. Another product is the Nymi Sports Wristband, which uses your heart’s rhythm as a security key, and also stores your bitcoin information. The benefits of using a hardware wallet are that you are storing your virtual currency in a place that malicious hackers cannot access over the internet, or server that you’re connected to. Often online casinos will have a cold storage wallet, that cannot be accessed from the internet, as a way of keeping players’ funds safe. Online wallets are exactly as they sound. You hold an account with someone else and they store your private keys on a server connected to the internet. There are plenty of different bitcoin wallets that cater to cryptocurrencies and have strong reviews. Sometimes these online wallets will work across several different platforms, including desktop and mobile wallets, allowing you to access and use your bitcoins at any time. Arguably the most popular wallet is Coinbase, which is both a bitcoin wallet and an exchange. It also caters to US bitcoin users. Another wallet that we recommend is Blockchain, who have proven to be security conscious and easy to use. Storing your bitcoins in a paper wallet is printing your bitcoin addresses and private keys on to a piece of paper. This is preferred by some because you are not allowing someone else to store your information. There are now services that will even turn your bitcoin key codes into QR codes. How can I keep my bitcoins safe? Storing them at a respected online wallet, or lashing out and buying a hardware wallet are two good ways to begin. But the way to keep your bitcoins safe is to have strong passwords on any bitcoin-associated accounts, keep them in a safe place and don’t tell your friends your passwords. Obviously there have been several high-profile security breaches such as when the Mt Gox exchange had millions stolen from it, but these incidents are isolated and as more time goes on the resources put into keeping our accounts safe are becoming more prevalent. In 2019 the safety of bitcoin wallets is at an all-time high with very few reports putting a negative spin on crypto safety. How can I stay anonymous while using Bitcoin? Bitcoin was founded with the intention of being anonymous, but the reality is there are plenty of ways to track a bitcoin user. Take into consideration that you can track every block of the blockchain down the line. So theoretically if you had signed up at a bitcoin wallet and deposited money from your bank account it can be tracked. If you wish to remain completely anonymous, there are things you can do to safeguard yourself. These include depositing money via a bank branch into your bitcoin wallet account’s fiat account. You can also use tools like coin mixing which put your bitcoins in a communal pool, before reissuing them to different people. Strong passwords are the key to keeping your Bitcoin wallet secure. Make sure they are not your mother’s maiden name, or your birthdate. In fact if you’re a bitcoin user you probably should use some sort of password manager, which will safeguard your accounts. This author for instance uses a password manager and has no idea what any of his passwords are, barring the master password. Another thing you can do to safeguard against online attacks is use a hardware wallet, like you read about above. The fact they can’t be accessed from the internet gives you a peace of mind, given the high value of bitcoin. You can also write down the codes that prove that you’re the owner of whatever amount of bitcoins.